Bring like-new items that will go directly to survivors of human trafficking to help them start new lives. Women rescued from this abuse have nothing. Your donation will help these women look for jobs, make court appearances, develop self esteem, and further the healing and restoration process. 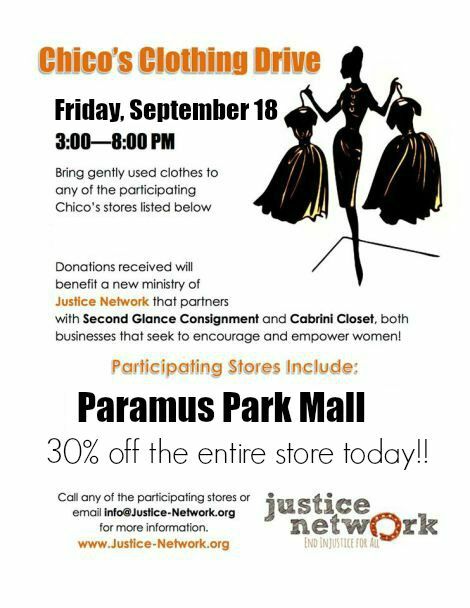 Chico’s in Paramus is accepting your donations from 3:00-8:00 pm Friday Sept. 18. Please mention that you heard about this initiative from Justice Network. And take advantage of their fantastic sale of 30% off the entire store!